Carpenter Ant Services – Grand Rapids Pest Control, Inc.
Carpenter ants are very large, often-winged ants. These ants are usually completely black but may contain some slight coloration on their legs and/or body. They generally nest in wood, even though they do not eat wood. • Initial Carpenter Ant Treatment: Grand Rapids Pest Control provides a full-year guarantee on carpenter ant treatment, starting the day of service. This treatment eliminates existing carpenter ants and prevents further infestation one year from the date of service. 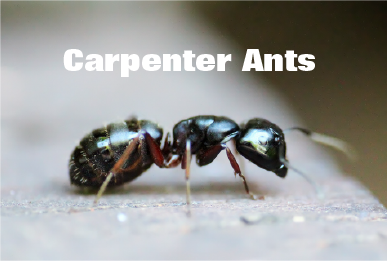 • Renewal of Carpenter Ant Service: once initial carpenter ant treatment has been performed, the customer may elect to renew treatment the following year and every consecutive year thereafter at 1/2 initial-treatment rate (price based on the current price at the time of renewal). Additional charges will be applied to your order if either “you “Need Service on Saturday” or “Need Immediate Service.” Cost for these services if needed is an additional $50.00 If ordering by email: please include these extra fees in your total when sending your order. If ordering by email: please include these extra fees in your total when sending your order.